Though not traditionally associated with steel drums, these ABBA hits are pop classics and work in a multitude of settings. The medley includes "Dancing Queen," "Knowing Me Is Knowing You," "S.O.S.," "Take a Chance on Me," and "Waterloo." 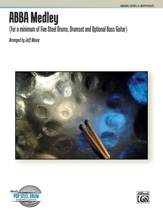 Add variety and energy to your next concert or gig with this medley arranged by Jeff Moore for the developing and professional-level band for Lead, Double Tenor, Double Second, Cello/Guitar, Bass Pans, Bass Guitar (optional), and Drumset.